So, I work in a cubicle. It’s a nice cubicle, with glass walls instead of the blue-carpet-covered-corkboard crap, but it’s a cubicle nonetheless: no door, big desk, computer – you know the drill. 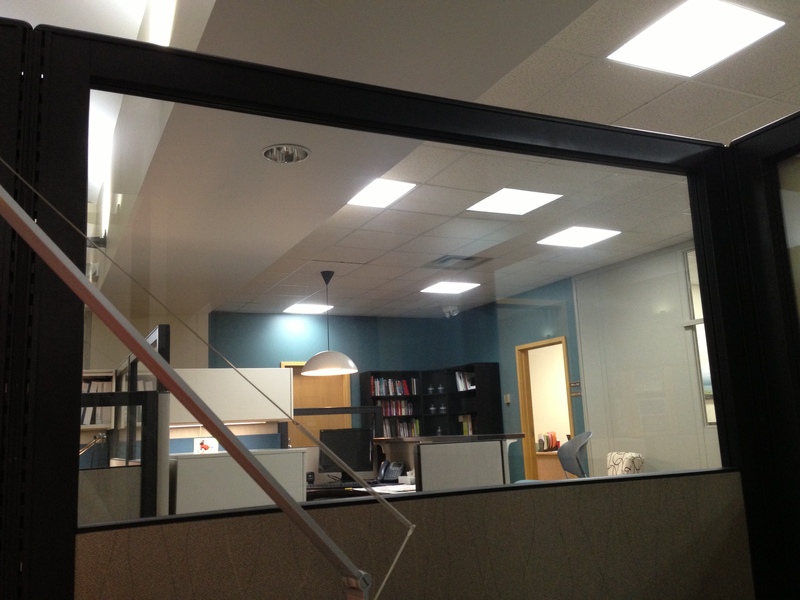 The problem is that the other side of my glass wall faces a main walkway in my office – great for being a busybody and knowing who is where at most times, less great when people see you through the glass and remember something vitally important that they need to tell you. Them standing on their tippy-toes and pointing their faces at the top of the glass in an effort to help their voice carry over to my ears (yes, it has happened). All of this has made me decide that I need to take some decorating tips from Big Boy. Have you ever gone to a Big Boy and had more than the designated four people in your party? They do this awesome thing with the booths where they will take out the middle window section that divides two booth, letting you see everyone in your overly large party without having to sit at separate booths (at least, this is an option at the Big Boy I frequented in my childhood). It was an amazingly easy way to be able to talk to people, and would really solve my people-talking-to-me-through-a-window-like-a-penguin-in-a-zoo problem. I was going to write about how much I hate all of the news articles about digging up an empty space where Hoffa is supposed to be buried, but I decided the story of how my boss bought me socks was more fun. This was at my old old job, the first full-time job I had right out of college. I was working at a small family-owned company, where there were literally four of us (and I was the only one not family), so it was really laid back. Like, jeans and tennis shoes with a cat in my lap laid back. When the packaged arrived, he opened the box and went, “Why did I buy these? These are awful!” Not knowing what awful thing he had inadvertently bought, I turned around to find him holding an awesome pair of argyle socks! Nevermind the sensible black pumps. 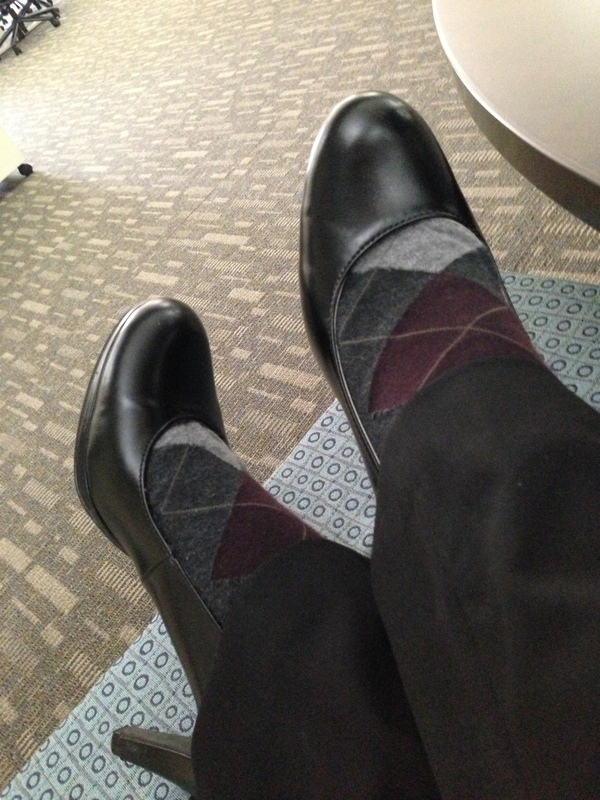 Because I liked them so much, and because he would never dream of wearing argyle socks, my boss gave them to me. Even though that relationship ended on a poor note (which is a whole other story), I still think of my boss and that job when I wear them. Which is a lot, because I only have about three pairs of work-appropriate socks now that I have to dress up every day. Ever have one of those days where you start out just wishing everything would go away so you could go to sleep, and then something happens that just hypes you up so that you are able to get through the rest of the day with a pleasant smile on your face? Well, today was like that for me, and here’s the person responsible. I was scrolling through my Facebook stalker feed today when I got to work (as I am wont to do), and this popped up. This is my friend Erica, and yes, she is being a badass at work. I know it’s only the beginning of June, but I think this is the funniest thing I’ve seen all month. I seriously giggle every time I see this. It needs to be my background photo on my computer to look at when I’m having a bad day. Apparently, Erica is going to a wedding today, and can only curl her hair with sponge rollers. Because her office (my former office) is really laid back, she decided to wear her curlers to work, looking like a housewife from one of the square states. If you think that this picture is amazing (which it is, so don’t be afraid to admit it), you should check out the blog she started when she ran off to Vegas to get married. Seriously, she can spit out pop culture references like nobody’s business, and working with her was what kept me sane the last few months of that job. So, my job entails a lot of social media posting/tweeting/trolling, and occasionally I get mind-trapped by strange articles with odd headlines (read this blog entry about an article on blue balls, if you think this is a weird tendency). While searching for relevant things to post, I came across an article about a couple that flew to Hawaii to give birth with dolphins. Seriously, this is the new way for rich people to spend their money. Now, I’ve heard of the benefits of having a water birth, but something is seriously wrong with trying to justify giving birth among dolphins. 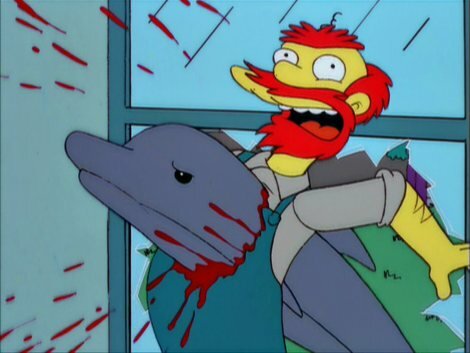 That is not what dolphins are for. Yes, that screen says “Killer Dolphins.” Don’t believe me? 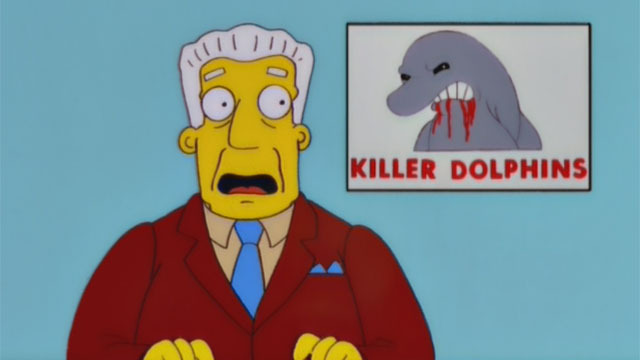 No, I do not believe that I will be having a dolphin-assisted birth any time soon. Let it be known that I actually work with highly intelligent people. Everyone has a college degree, and many people that I work with have their master’s or doctorate in their field. And yet, in a meeting at work today, a psychologist and Ph. D. said the following phrase. Some things take two days. Like weekends. Later on that day, after traveling to meetings and being stuck in a car for several hours, we decided to optimize on those words of wisdom. Some things take two hands. Like burrito supremes.